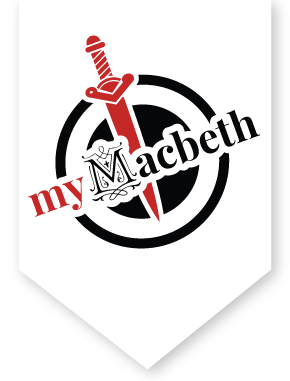 Patrick Andrew Jones is thrilled to have worked with Greg Watkins and the myShakespeare group on this incredible website. Jones is a recent graduate of the prestigious MFA program at the American Conservatory Theater in San Francisco. Some favorite credits include Macbeth, Stanley Kowalski, Brutus, and KJ in "The Aliens." He is a passionate actor, educator, collaborator, writer and watcher of crime-related shows on Netflix. Thanks to my family, friends, and this incredible group of artists! Bay Area actress and production manager for the African-American Shakespeare Company (AASC), Leontyne Mbele-Mbong, is delighted for this opportunity to explore Macbeth for a second time, having previously played seven different roles, including Lady Macbeth, in a 5-person all-female production. Leontyne has done 13 Shakespeare productions, and will be doing her third Richard III this summer with the AASC, but her favorite has to be playing Beatrice in Much Ado About Nothing. Besides Shakespeare, Leontyne performs at theaters around the Bay Area: favorites include Breakfast with Mugabe and Temple at the Aurora, Top Girls at Shotgun Players, and most recently Watch on the Rhine at Berkeley Rep and the Guthrie in Minneapolis, which earned her her Equity Card and an opportunity to visit her alma mater in St. Paul, Macalester College. So he ran off and joined the circus. Over time, he saw the world—New York and London, Australia and Cincinnati—playing roles in wonderful plays by wonderful playwrights: Ibsen and Chekhov, Albee and Kushner and Sarah Ruhl. Along the way, he was especially grateful for the chance to do Shakespeare: He has played Romeo and Mercutio (not at the same time), Petruchio and Pericles, Banquo, Benedict, Brutus, Iago, and Hamlet. Ron Campbell is an actor and clown who has toured Europe, both North and South America and Japan with Cirque du Soleil in Kooza and stars in Teatro ZinZanni as Cecil B. De Grille. He has appeared in several award winning one person shows including R. Buckminster Fuller, The Thousandth Night, Shylock, The Boneman of Benares and one man adaptations of The Dybbuk and A Tale of Two Cities. His life long love of Shakespeare began when his grandmother read him Macbeth as a bedtime story at age 8. He has since appeared in over forty Shakespeare productions playing some of his favorite roles including Iago, Richard The Third, Mercutio, Malvolio and Shylock. Mr. Campbell has also been fortunate enough to play such roles as Don Quixote, Sherlock Holmes, Cyrano de Bergerac and Vladimir in Waiting for Godot. Other theatres in which he has played leading roles include The Old Globe, Old Red Lion (London), American Conservatory Theater, The Mark Taper Forum, The Habima (Israel), Huntington Theatre Company (Boston), Seattle Repertory Theatre, American Stage Company, Mercury Theatre (Chicago), California Shakespeare Theatre, The Aurora Theatre, San Diego Repertory Theatre, Pasadena Playhouse, Theatre Works, Los Angeles Theatre Center and The Actors Gang. Ron received a Fox Fellowship for Distinguished Achievement from Theatre Communications Group, a Citation of Excellence from The American Society of Arts and Letters and London, San Francisco, Los Angeles, and Chicago Drama Critics Circle Awards. For more on Ron check http://www.soarfeat.org. Louis is a third year actor in the Brown University/Trinity Rep MFA Program in Acting and Directing. Regional theater includes work at Stanford Repertory Theater, The Gamm Theater, Berkeley Rep, Trinity Rep, and the Williamstown Theatre Festival. His favorite Shakespeare play of late is Love's Labour's Lost, largely because it contains the longest word in all of Shakespeare: honorificabilitudinitatibus. Emily Jeanne Brown is an actor, musician and writer living in New York City. She attended Smith College where she majored in Theater and the American Conservatory Theater where she received her MFA in Acting. She has also studied at The Guthrie, British American Dramatic Academy and the Berkshire Theater Festival. Favorite Shakespearean roles include Diana in 'Alls Well That Ends Well' at the American Shakespeare Center, Imogen in 'Cymbeline' and a Witch in 'Macbeth' at Texas Shakespeare Festival, and Isabella in 'Measure for Measure' at BADA. Her earliest memory of Shakespeare is sitting in the park eating a picnic with her family and watching 'Othello' at eight years old. Her favorite play in the canon is 'A Winter's Tale'. She is forever grateful to her parents for buying her the comic book versions of Shakespeare and helping her connect at an early age to his amazing language. Matthew Libby is a Los Angeles-based writer, actor, and director. He has been performing in and directing Shakespeare's plays since the age of twelve, most recently with the Stanford Shakespeare Company while a student at Stanford University. Favorite experiences with the Bard's work include playing Benedick in Much Ado About Nothing and directing a minimalist production of Macbeth. He thinks Richard II is Shakespeare's most underrated work and highly recommends you read it. Alex Johnson is the Director of Programming and Outreach for the Massachusetts Educational Theater Guild, where he teaches, designs events, and develops theater programs at underserved schools. Find out more about Alex's theater education work at www.metg.org. An actor, director, and writer, his work has been seen on stages in New York, Boston, San Francisco, and Juneau, Alaska. He's most interested in art that reveals or highlights previously unnoticed parts of our lives together. He has been a Shakespeare fanatic since the age of 13, and someday hopes to work on a production of Measure for Measure, his current favorite Shakespeare play. I received my B.F.A. and M.A. in Theatre at the University of Colorado at Boulder, where for several seasons I appeared in various roles in the Colorado Shakespeare Festival. I also sold t-shirts, served as dramaturg (literary assistant to a director) and worked in the box office. One of my favorite things about Shakespeare has been learning stage combat. I've had chances to perform stage fights with rapier and dagger, broadsword, epee, Roman short sword and quarterstaff. Therefore my favorite memory of performing in a Shakespeare play has to be the final duel in Hamlet, a fight with rapier and dagger—my first sword fight. One night the actor playing Laertes nicked my hand with his sword, giving me a small cut, so as I lay dying Horatio struggled to apply a band-aid that someone had slipped to him. My favorite Shakespeare play, however, is King Lear. I've been in two productions of it, and it never gets old. The rawness of the emotions—the depth of hatred and the extremity of grief, expressed through such stark and beautiful language—makes this a uniquely terrifying play. I went on to get my Ph.D. in Drama at Stanford, where I now teach in the Oral Communication Program. But I still get to do some acting once in a while. Lea Zawada is an actor from Portland who got her start at Northwest Children's Theater and School where she performed throughout her youth. NWCT roles include Red in Little Red: Riding Hood, and Pinocchio in the steam-punk version of the classic story. At Stanford, Lea performed as Angie in Top Girls and Joan in Far Away. Her senior year at Stanford she produced, directed, and starred in the show Miss Julie. She is currently getting her MFA in acting from NYU. Her favorite role from Shakespeare is Ariel from the The Tempest because Ariel can manifest in so many different forms! Malaika Murphy-Sierra is a masters student at Stanford University studying Environmental Communication. For the last 12 years, her favorite activity has been theater and improv. One of her favorite roles was Edmund in King Lear with the Stanford Shakespeare Company during her sophomore year. What really inspired her to learn more about Shakespeare was playing the hilarious and silly role of Bottom in A Midsummer Night's Dream in the 6th grade, where she really found her passion for theater and comedy. She hopes to use her masters to tell stories that help the Earth! Adi Chang is a student at Stanford University, where he is majoring in Theatre & Performance Studies. After he graduates in 2019, he plans on pursuing a career in theatre in New York City. He started acting in plays as a seventh grader in San Diego, after watching his older sister perform the role of Celia in Shakespeare's As You Like It. Alan Littlehales is an actor and teaching artist based our of Los Angeles. He recently graduated from the American Conservatory Theater with his MFA in acting. Alan is thrilled to play Lennox in the MyShakespeare production of Macbeth. Recent Shakespeare credits include Lucentio in "Taming of the Shrew," King Duncan/Macduff in "Macbeth," and Touchstone in "As You Like It." His favorite Shakespeare plays are "A Midsummer Night's Dream" and "Julius Caesar." Alan is a proud member of Actor's Equity Association. One of my earliest memories of watching Shakespeare is seeing a production of "A Midsummer Night's Dream" (dir. Mark Rucker) at the Oregon Shakespeare Festival that was set in the 1960's. The fairies were running around in fishnets and climbing the giant metal set pieces while the Players drove onstage in a VW bug - the play ended with a giant dance party in the audience. It was the first time how I realized how much Shakespeare's words could transcend time and space. Diana Gonzalez-Morett is a bi-coastal (NYC-LA-SF) lover of storytelling in many mediums and passionate community collaborator. She has worked regionally at the American Conservatory Theater, Guthrie Theater, Berkeley Repertory Theater, and A Noise Within. She is currently developing a solo-show titled; Memorias Cubanas, which was featured at The Marsh Theater in San Francisco and is in post production for her first short film, TORMENTA that she co-wrote/produced this past year. In May 2017 she received her MFA in Acting from the American Conservatory Theater (A.C.T.). Gonzalez-Morett received her BFA in acting from Marymount Manhattan College and is an alumnus of the National Association of Latino Arts and Culture Leadership Institute and an alumnus of A Guthrie Theater Experience where she devised and performed the play Intersections. Diana first fell in love with Shakespeare at a young age when her father bought her a beautiful copy of a Midsummer Nights Dream, she has been hooked ever since.